I know we all have had someone looking at our bike we just spent days, weeks and years getting it ready for the open road. This buddy says “hey whats missing there”? Then everyone look around to see what could have fallen off. Well nothing goes there unless its needed for a ground cable for an accessory. 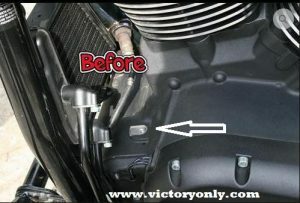 No more reason to have a conversation about whats missing just use our New Block off cover with hardware. Cleans up the missing part look everyone looking at the bike gets over their face. 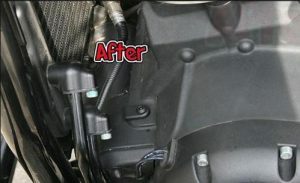 This is a quick and easy mod that hides the bare aluminum spot on the front of the crankcase. By adding this piece the engine appears complete versus having a very obvious void on the crankcase.